In any 90-mile walk you will expect to come across the occasional muddy patch, and A Dales High Way is no exception. After prolonged periods of heavy rain (such as we experienced throughout 2012), some of these can be a bit of a challenge . So, here are the worst bits along the route, with a few survival tips on how to cope. General Tips: Carry a walking pole, even if you don't usually use one. Very handy for prodding suspect muddy spots, good for balancing when crossing tricky wet patches, and also helpful in deterring frisky cattle. A spare pair of socks helps if disaster strikes. You expect wet patches on any peaty moorland stretch, but generally the going across Rombalds Moor is pretty good underfoot. 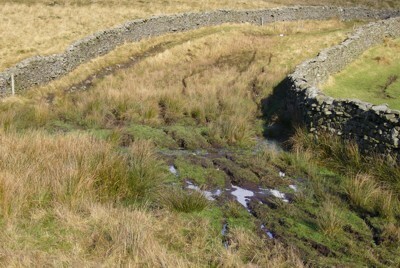 The wettest patches are found early on on Bingley Moor, just over the wall past Horncliffe Well. Solution: Zen and the art of bog-yomping: Go wide, move fast, pick out clumps of heather, and you soon pass the worst - it's only water remember! As you drop down alongside the wall to the road, there's a very muddy patch. Some board walks help half way down. Solution: Take your time and tread carefully. You can go wide and avoid the mud, but there's a deep cut stream to cross waiting at the bottom. There used to be a very muddy area in a narrow enclosed section, churned by cattle, just before the gate to cross the busy A65. Passable in dry weather, after heavy prolonged rain it became an impassable quagmire, which would have defeated the Roman army! UPDATE: (April 2018) - The encroaching vegetation at the sides has now been cleared, and though still muddy in places it is now much easier to find a way through unscathed! 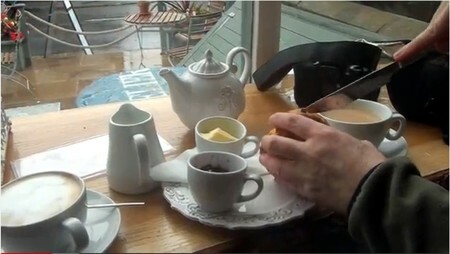 Solution 1: Take the optional alternative route through the village of Addingham and enjoy a nice coffee at the deli instead. The Street, above Addingham. Looks deceptively attractive, actually was a quagmire. The Alternative, through the village via the Deli. Solution 2: If you don't mind a bit of road walking and are bypassing Addingham entirely, you can avoid all the Addingham mudspots; a quicker option presents itself to pick up the line of an ancient packhorse trail which crosses Addingham High Moor from Keighley. Instead of leaving the escarpment edge at the quarry at Black Hill, continue along the ridge for a further 250 metres to a bench near a wall corner at Windgate Nick. The line of the old packhorse trail is clearly visible dropping slightly west of north to Slade farmhouse, where it continues now under tarmac as Straight Lane. Cross Brown Bank Lane and continue downhill on Turner Lane, descending steeply at the bottom to cross the very busy A6034, bearing right along the pavement and then left into Crossbank Road, which goes on to turn sharply left onto the bottom of Moor Lane at Causeway Foot. You are now back on the line of the old “Roman road” to Skipton. This involves 1½ miles of road walking, but cuts half a mile overall and avoids having to cross the very busy A65 bypass (twice)! (Download Addingham Route Options Guide here). The mostly likely problem here, in summer, is that the main bridleway will be overgrown by bracken, which can be avoided by taking a higher path above this. Further on, as you bear left down towards the gate, there's a wet area crossing a couple of streams, which can get quite boggy after sustained rainfall. Solution 1: This is not too difficult - take your time and a bit of careful navigation will see you quickly past. Solution 2: An escape route from Sharp Haw in bad weather, avoiding Flasby Fell, can be found by following the ridge beyond the trig point NW along a clear track, curving west as it descends to join a wall on the right. It leads down to a gate, through which a woodland track zigzags down to join a footpath by the Helen Handley memorial seat. Be aware that this short section from gate to seat, though popular and well walked, is not a right of way. Now turn right and follow the clear footpath down through another gate to cross a meadow, curving gently left as it descends to a gate crossing Septeria Gill. Beyond, an enclosed track leads onto a farm access road, which is followed straight ahead down to Flasby. (Download Flasby Fell Route Options Guide here). This is usually a beautiful riverside stretch, shared with the Dales Way, and very popular. Consequently, after prolonged rainfall it can become quite muddy and slippy. Solution: If you've had a tough day, stick to the quiet country road that runs past Bridge End for a mile into Dent - it's a bit quicker too, so you'll get to the pub sooner. UPDATE: Work has been ongoing over the winter months (2012-2013) to improve this popular section. Just above the farm you join an ancient, enclosed green way. 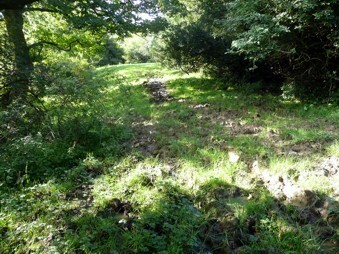 There's a particularly boggy section at a bend, and the track further up may become churned by farm vehicles. 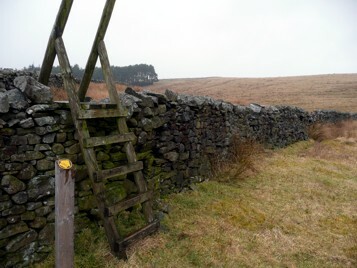 Solution: After wet weather, take the suggested Alternative, by crossing a ladder stile on the left just beyond a gate into the enclosed way, and continue north over rough pasture parallel to the enclosed track. Rejoin the track at a gate on the right where it levels out. It's a bit quicker too. On a fine sunny day the walk along Hoff Beck is a sheer delight, but after prolonged heavy rain the beckside is liable to suffer flooding. The most badly affected section will probably be between Rutter Mill and Hoff. Solution: Take to the quiet country lanes that run alongside the route between Great Asby and Appleby. 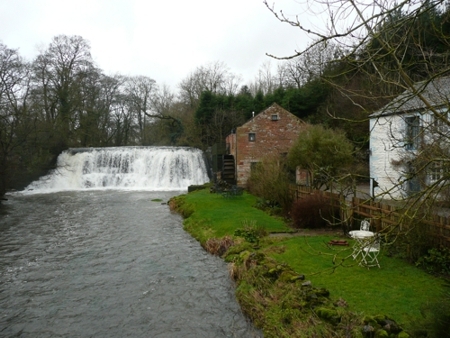 Good escape points present themselves at Rutter Mill and Hoff if needed, with Rutter Mill offering the best option, as you'll have some idea of the going underfoot by then. From Rutter Mill cross the footbridge and head up the access road, turning left onto Broadmire Road. 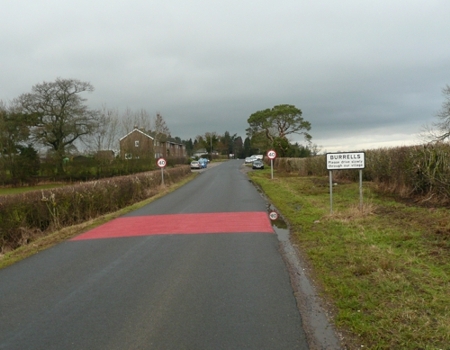 This is a very quiet country road, but what traffic there is may be travelling very fast, so take good care and keep to the right side, facing oncoming traffic. At the junction turn left along Helm Road. This a little busier but with wide verges, and walk on to Burrells. Here turn right at the junction onto the still busier B6260, heading for Appleby. There are a couple of vergeless spots, so great care is needed. 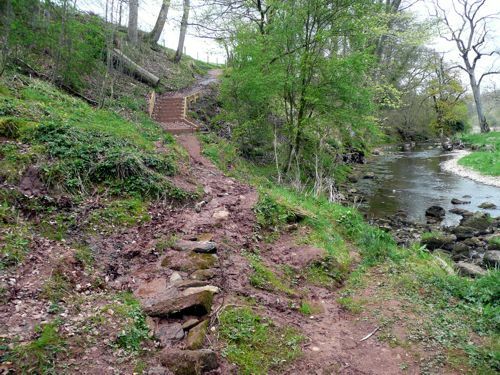 Join the main route at Colby Lane beneath the castle walls for the entrance into Appleby. This is 3.4 miles of fairly tedious road walking, though offering good long views of the Pennine range in places. It is, however, a third of a mile shorter than the main route, and free of mud and cattle. After heavy prolonged rain Rutter Falls is in full spate, though this may mean flooding along Hoff Beck. The alternative, 3.4 miles of road walking along fairly quiet though fast country roads. In early 2009 part of the embankment collapsed between Cuddling Hole and Bandley Bridge, near the end of the walk. The path had been swept away, together with the board walks, leaving a red muddy terrace. Passable in dry weather, a gloopy mess in wet weather. UPDATE - Jan 2017: Work has begun to improve this section.